In a mix of party and protest, people have gathered for nightly protests outside the White House for three weeks. Acting as the backdrop of the crowd is Herndon-Reston Indivisible, a community action group that aims to push back against President Donald Trump. 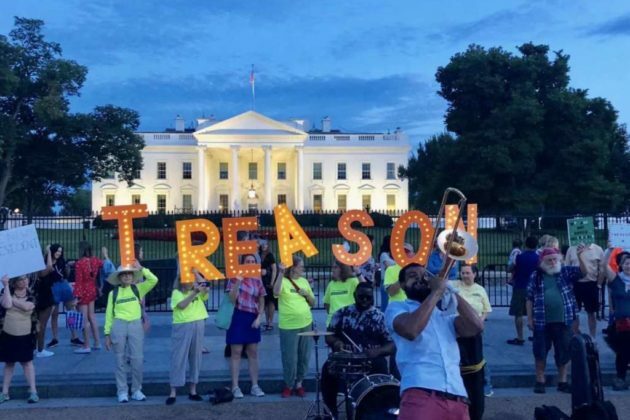 Protests began on July 16 after Trump appeared to agree with Russian President Vladimir Putin, who denied interference in the 2016 U.S. presidential election. 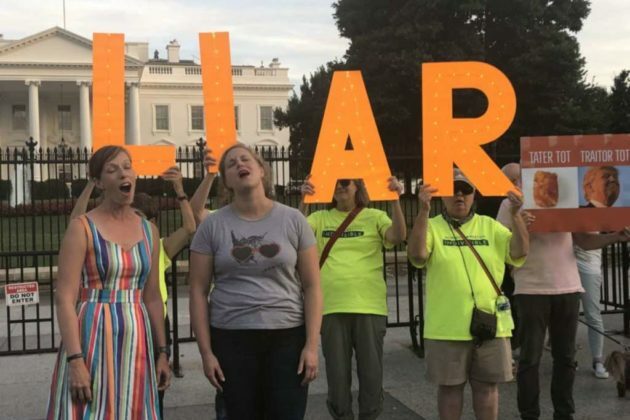 Kremlin Annex plans to be there as long as Trump is in office. 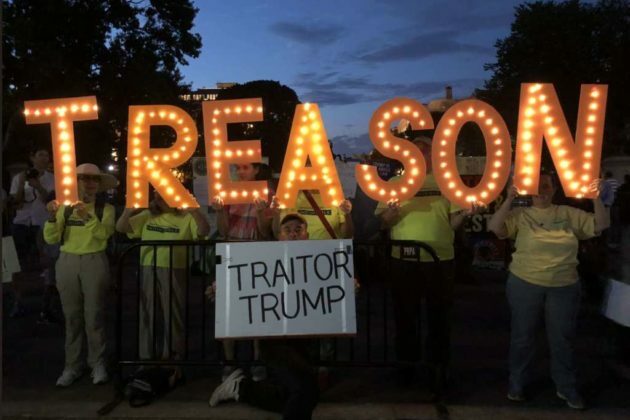 On average, seven people from the organization join the nightly protest, according to Joanne Collins, a member of Herndon-Reston Indivisible and co-leader of the group’s elections committee. Collins says the environment is full of energy. Earlier this week, Rosie O’Donnell, an actress and TV personality who has been vocal against Trump, stood alongside Broadway musicians for the protest. 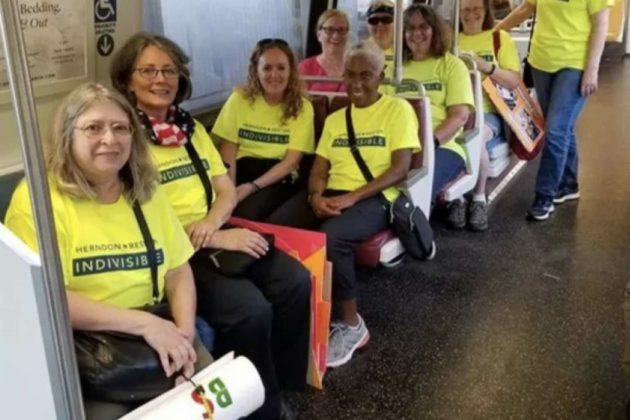 Herndon-Reston Indivisible was formed by Heidi Zollo and Carrie Bruns following the 2016 presidential election. The organization rallies on ten issue groups, including topics like the environment, immigration and election activities. 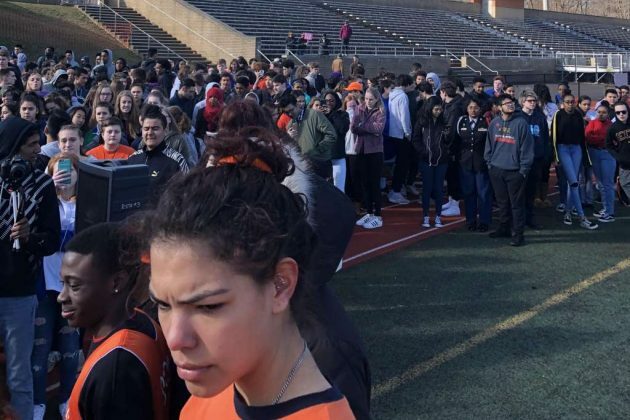 Roughly 200 students participated in a walkout on Friday (April 21) at Langston Hughes Middle School (11401 Ridge Heights Road). The walkout was in honor of the anniversary of 13 victims of the Columbine High School shooting. Students left the school building at 10 a.m.. 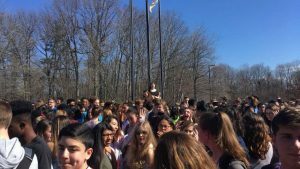 Most students re-entered the building and returned to fifth period class while a small group of students remained to continue the walkout. 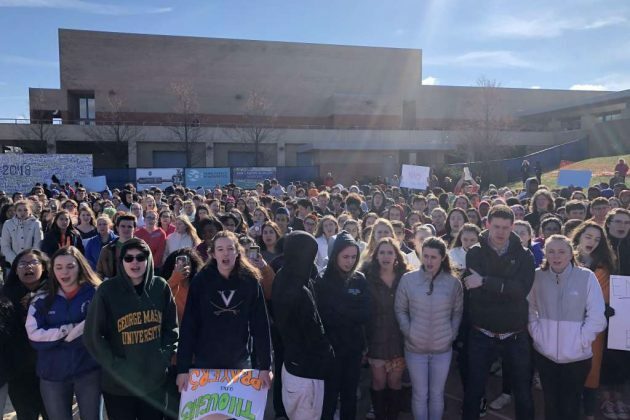 FCPS respects the rights of our students to engage in peaceful protest and express their opinions through speech and other ways as long as it is done respectfully, does not interfere with the rights of others, and does not disrupt learning in the school. Our school is committed to providing an environment where everyone is treated with respect and encouraged to help others. Our teachers, administrators and staff continue to reinforce a sense of positive school community focused on teaching and learning in our increasingly complex world. We thank you for your continued partnership in working with your child to discuss meaningful actions that they can take to engage in studies of all issues and participate fully in their community. Similar walkouts happened at the school on February 21 and on March 14 in order to remember the victims of a shooting at Marjory Stoneman Douglas High School in Parkland, Florida. South Lakes High School is emphasizing its security and protest policies after a Florida high school shooting left 17 students and faculty dead. 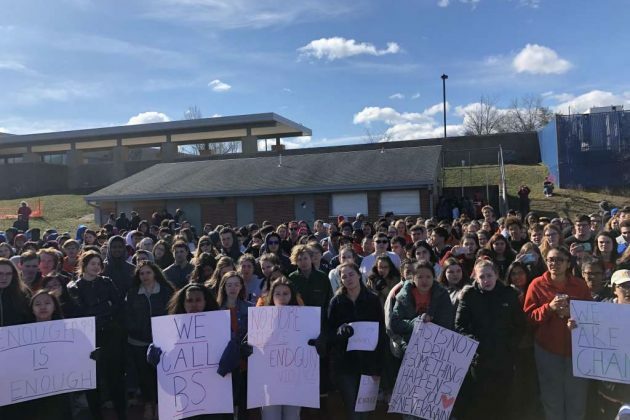 Kim Retzer, the school’s principal, said the last several days have been “intense as the conversations and actions around school violence have taken place.” Last week, more than 350 students walked out of the school and stood outside midday for 17 minutes. 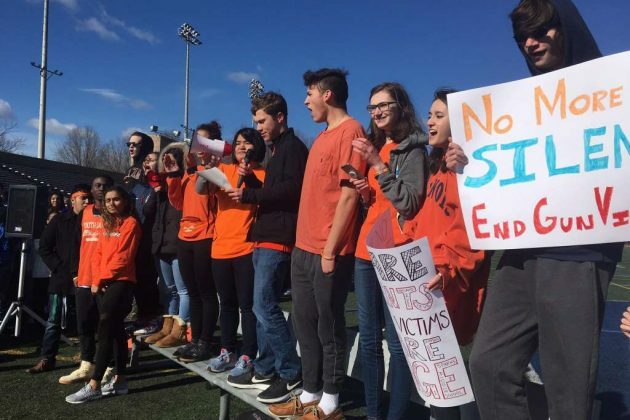 “Students participating in marches or walkouts are expected to participate in class and to respond to administrative questions and directives in the same way as all other students,” she added. School policies also encourage teachers to remain in class with students who do not participate in walkouts. Staff can participate during “non-work time,” she said. The school regularly assesses its safety protocols, staff indicated. Retzer described Dave Bonner, a school resource officer stationed at SLHS as “pro-active” and “experienced.” Bonner routinely collaborates with the resource officer at the adjacent Hughes Middle School. The school installed interior and exterior video surveillance several years ago and is in the process of upgrading older equipment. Retzer expressed support for the feedback and support received by the school in the past week. “I know I have hugged my child a little tighter in recent days,” she said. A Herndon-area resident is organizing a “vigil for peace” to be held tonight after the weekend’s violent protests in Charlottesville. According to a post on The Action Network website, Suzanne Nordfelt says interested individuals can meet at her home on Treadwell Lane at 7 p.m. for the event. We are standing in solidarity with Charlottesville. Join us. Come put some positive energy in the universe and hold each other up. Please bring a candle (if you have one) and your walking shoes in the event we decide to parade down Reston Parkway. Wearing white is a plus but completely optional. Please share far and wide. We will meet in my cul-de-sac so there is lots of parking. Over the weekend in Reston, a small “Stand With Charlottesville” gathering (pictured at top) took place Saturday night. A protest in DC on Sunday drew thousands. Clashes between far-right “Unite The Right” protesters and counterprotesters in Charlottesville on Saturday afternoon resulted in a number of violent altercations. The showdown turned tragic when an alleged white supremacist plowed a car into a crowd, killing one and injuring nearly 20 more. Additionally, a Virginia State Police helicopter responding to the scene crashed, resulting in the deaths of two troopers. Local, state and national leaders have urged a stop to the hate in the aftermath of the events. Today's terrorist attack demands @GOPoversight attention. Must investigate troubling rise of white nationalist, KKK & neo-Nazi acts of hate. Yesterday was a very troubling day for our Commonwealth. Let us come together to mourn the victims, while we reject hate and discrimination.